The Indiana Republican Party's quest for Affordable Care Act "horror stories" didn't really go according to plan, the Indianapolis Star reports. 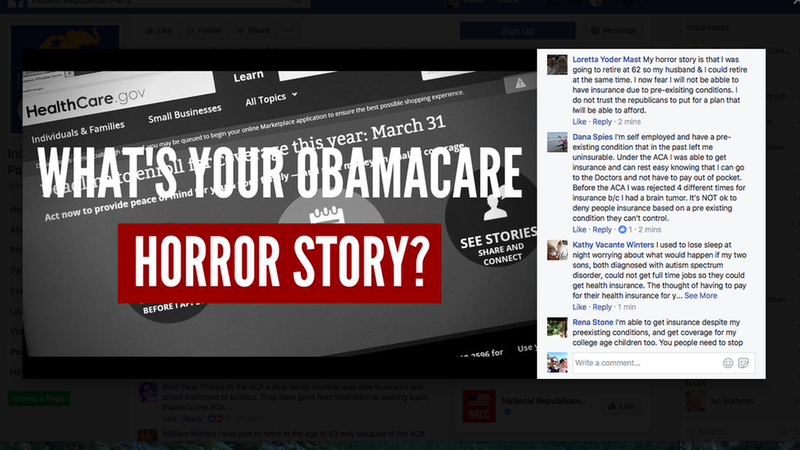 When the party in Vice President Mike Pence's home state put out a Facebook request for stories about bad things — rising premiums, fleeing insurers, burdensome regulations — it instead got flooded with stories about good things, like people getting health insurance. Why it matters: The outcome was predictable, given how the Internet works — you're never, ever just reaching like-minded people. But it's also a good measure of where the energy is in the ACA debate right now. Sure, the Indiana GOP will find people who suffered premium hikes or lost their insurers, because that is part of what's happening. But there are also a lot of people who were personally helped by the ACA — and that's the side that is now fighting back.